Produced by Vishaal Asrani’s Institute Of Performing Arts”-Mumbai in association with BENCHMARK CARS- Dealer of Mercedes Benz passenger vehicles. WHAT IF SOMEONE COULD TELL YOU, WHAT YOU ARE THINKING & PREDICT YOUR FUTURE? EVEN KNOW YOUR DARKEST FEARS & YOUR DEEPEST DESIRES? 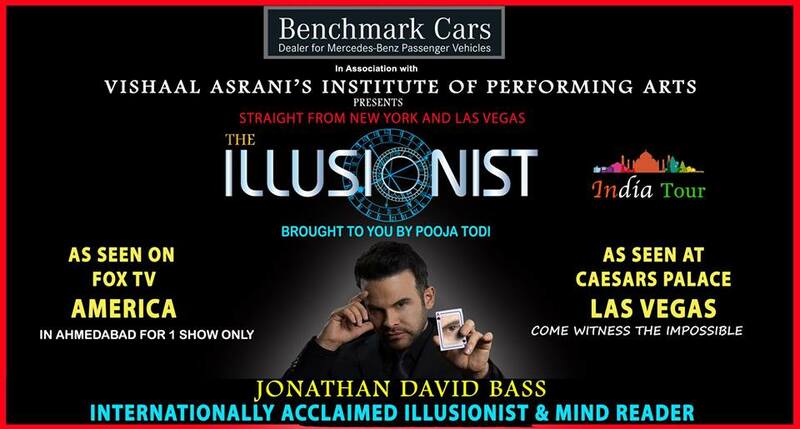 JONATHAN DAVID BASS from NEW YORK, performs the most amazing mind-reading acts, including hypnotism, levitation and even death-defying stunts live on stage. With his unique brand of illusion, Jonathan has been the feature act in over 60 television shows around the world, including “The World’s Greatest Magic“ on NBC and “Masters of Illusion“ on FOX.